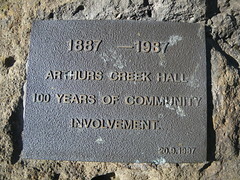 Arthurs Creek Mechanics' Institute and Free Library. Established 1887. The Mechanics' Institute movement began in British urban industrial centres in the early 1800s. A "mechanic" was a person applying skills and technology. During the 19th century, most towns in Victoria established a Mechanics' Institute or Athenaeum with a library and meeting hall. Common objects were the "spread of useful knowledge" and provision for "rational recreation" in the community. This plaque, No. 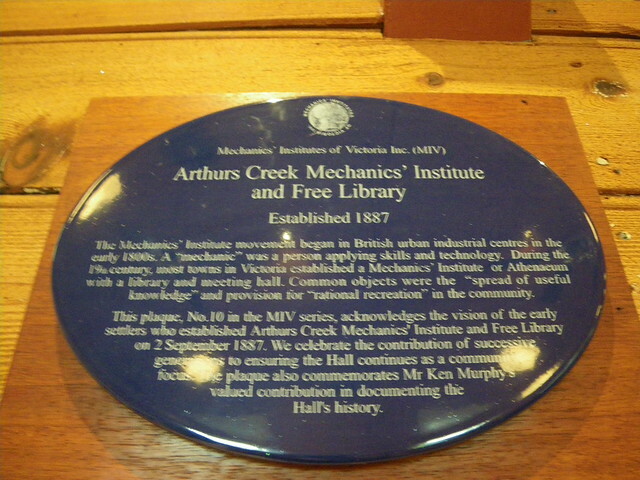 10 in the MIV series acknowledges the vision of the settlers who established Arthurs Creek Mechanics’ Institute and Free Library on 2 September 1887. We celebrate the contribution of successive generations to ensuring the Hall continues as a community focus. The plaque also commemorates Mr Ken Murphy’s valued contribution in documenting the Hall’s history.